An Aberdeenshire man who became British Ambassador to China and offered shelter to scared subjects during an infamous massacre has died at the age of 87. Sir Alan Donald was born in Inverurie on May 5, 1931, to Robert Donald and Louise Turner. His father, who was an infantry officer during World War I and later a teacher, died when Sir Alan was four and his mother moved to Aberdeen to raise their four children alone. Sir Alan was educated at Aberdeen Grammar School before receiving a full scholarship to Fettes College in Edinburgh. After National Service as a second lieutenant with the Royal Horse Artillery, he earned another bursary to Trinity Hall, Cambridge, and graduated with degrees in Classics and Law. He joined HM Foreign Service in 1954 and found his calling as a career diplomat as he ascended through the ranks. Sir Alan married his wife, Janet Hilary Therese Blood, in 1958 after meeting at Cambridge years earlier and the couple had four children. As well as being posted to China three times between 1955 and 1991, Sir Alan served as a diplomat in Paris, Athens, Kinshasa and Jakarta. Sir Alan was Ambassador to Zaire from 1977 to 1980 and Ambassador to the Republic of Indonesia from 1984 to 1988. The fluent Mandarin speaker, who was respected as an expert in sinology, the study of China, endured some harrowing experiences in his next post as the ambassador to the People’s Republic of China between 1988 and 1991. That appointment coincided with the Tiananmen Square massacre, in Beijing, in June 1989. During the student protests, he and Lady Donald sheltered more than 60 British subjects in the Embassy for several days while lorryloads of Chinese soldiers indiscriminately fired their automatic weapons in the streets outside their home. The demonstrations have become most commonly associated with a striking image of a lone pro-democracy protestor facing down a row of tanks and the death toll is reckoned to have reached thousands, though the exact figure remains unknown. Sir Alan’s son, Angus, visited the following year and described the scenes. He said: “There were lots of soldiers going around shooting at the embassy in 1989, which was still marked with bullet holes. A secret cable written by Sir Alan at the time was declassified only last December and provided previously unknown detail of the massacre. The message is now kept in the UK National Archives at Kew. Sir Alan was instrumental in the creation of the Sino-British Joint Declaration while acting as Assistant Under-Secretary of State (Asia and the Pacific) at the Foreign Commonwealth Office in December 1984. The deal was the first step towards the smooth handover of Hong Kong back to China in 1997. Having retired from the Foreign Office in 1991, he was able to watch that moment with pride from his home in Chiddingstone Causeway, Kent. Mr Donald added that Sir Alan was “the greatest dad”. He said: “He was wonderful, he was kindness personified. Sir Alan also became a director of several funds investing in China and President of the China Association. He wrote his memoirs, taught himself to paint watercolours and took cooking classes. A lifelong piano player, the pensioner also learnt to play the organ for his village church in his later years. 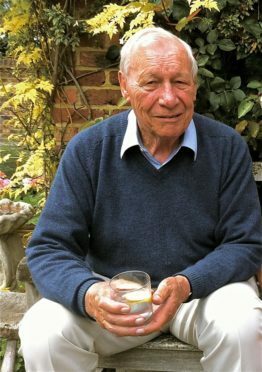 Sir Alan died peacefully in his sleep on Saturday, July 14, at Hospice in the Weald in Kent. He is survived by his four sons, his seven grandchildren and his wife.